Hunting is available for members wishing to BOW Hunt during the appropriate in-season hunting periods, and is subject to all hunting regulations and licensing within the State of Pennsylvania. Hunting on Club property is limited to Members only. In order to hunt on Club property, Members must have executed a Save and Hold Harmless Agreement. This Agreement is available from the Safety Committee Chairman only, no other. This Agreement must be notarized or have been witnessed by two Club Members. Agreement must be returned to Safety Committee Chairman prior to your hunt. You will be given a discrete number which you must place clearly on the driver’s side inside dash panel in order to advertise someone is on the property hunting. This number will advertise which Member is on Club property for purpose of hunting. See Rules and Regulations section for specific terms and conditions relating to this activity. 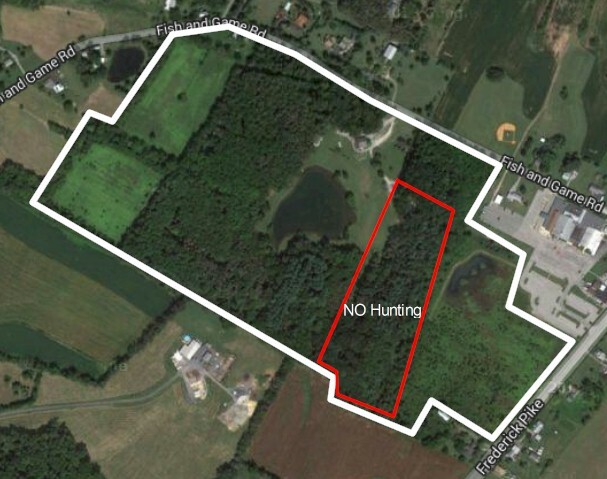 1) Hunting on The Littlestown Fish and Game Association grounds is restricted to members only. 2) Except for the archery committee platforms, permanent tree stands will not be allowed on The Littlestown Fish and Game Association property. No screw-in steps will be allowed. Manufactured tree stands only, blinds and accessories may be installed two weeks prior to the start of hunting season, and must be removed two (2) weeks after the close of hunting season. All stands, blinds and accessories left on the club property after two (2) weeks from the close of hunting season shall become the property of The Littlestown Fish and Game Association. 3) State and Federal seasons and bag limits shall apply. 4) Hunting in prohibited within the shooting range(s) impact zones. The impact zones will be marked. 5) Hunting is prohibited behind the rifle and pistol ranges. Impact area is marked with orange paint on trees. 6) Ingress and egress from approved hunting areas shall be from the parking areas, adjacent to the clubhouse, and parking is prohibited from shooting range parking lots. 7) Archery hunting (allowed) for deer on club property. 8) No rifle, black powder, shotgun or pistol for deer. 9) Small game hunting with shotgun only. 10) Put a Yellow Flag on all range(s) to temporarily close the range(s) to allow time to locate an animal. 11) Chairperson of hunting / safety hunting committee will determine number of persons allowed to safely hunt at one time.